With automated Clear Channel fare currently dominating the airwaves, radio deejaying is becoming a lost art. However, slivers of the FM dial still recall the medium’s golden age, with stations that eschew predictable playlists and sound-alike on-air personalities in favor of a more organic and, well, human aesthetic. Such outposts are increasingly rare. But for those who do tune in, underground radio represents a genuine alternative — or, as the University of Vermont’s WRUV 90.1 FM bills itself, a “real alternative.” Where else can you find radio shows with such eyebrow-raising titles as “The Floating Head of Zsa Zsa” or “Existential Carousel”? The playlists are as diverse and eclectic as those names imply. The same could be said of the DJs who produce them. 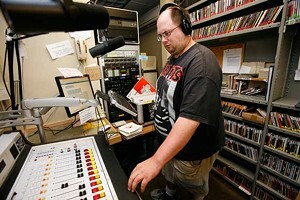 Brad Barratt, 27, is the host of “Janitors From Mars!”, a punk-rock, metal and ska show that airs Saturday nights on WRUV. He is relatively new to deejaying, having debuted last May. But already he has a firm grasp of the ins and outs of the trade and an appreciation for the station’s role in the community. He loves music. He eats, sleeps and breathes it. He tends to arrive at the station two — sometimes three — hours before his show starts to scour WRUV’s byzantine CD stacks for material. On off days, he regularly comes in for hours at a time to organize or review albums. 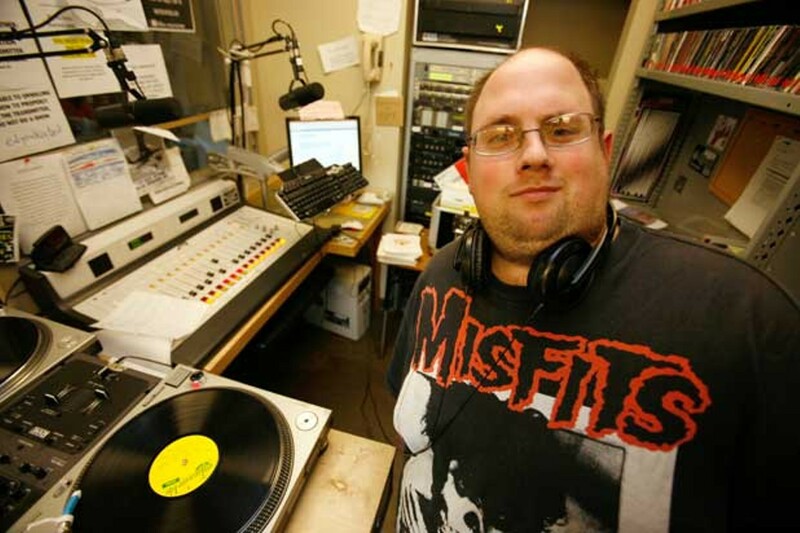 People like Brad Barratt are the lifeblood of college and community radio, and every station has one or two. Sort of. Brad Barratt is also deaf. A punk-rock aficionado, Barratt appreciates the newer stuff but is a classicist at heart. He lights up when asked about his favorites, reeling off a veritable “Who’s Who” of bands from the ’70s through the present: the Ramones, the Clash, NOFX, the Dropkick Murphys. At age 4, Barratt began to lose his hearing. Doctors from Burlington to Boston were baffled. They offered little or no explanation, beyond declaring the hearing loss both degenerative and permanent. To this day, the Swanton native has no idea how he came to be deaf. Barratt’s hearing loss was gradual. He was a saxophonist through middle school — hence his affinity for ska — and laments that he can no longer play the instrument. In truly punk-rock spirit, it’s just about the only concession to his handicap he’s willing to make. Barratt estimates he still has roughly 10 percent of his hearing. When asked to describe what music sounds like to him, he says he can hear — and feel — backing instruments: drums, guitars and bass. But he cannot hear vocals. Precisely for that reason, Barratt pays closer attention to lyrics than most of us. Profanity is a serious FCC violation, so during each show he scours lyric sheets for errant F bombs. The process gives him a singular appreciation for lyrics, which is all the more profound given that, in most cases, he’s never heard them sung aloud. Barratt got turned on to punk and ska through another WRUV show, “Dissection Theatre,” which ran in the early to mid-’90s. That show sparked his desire to become a DJ himself. Last year, he took a job as a janitor at the university — which explains both the title of his show and his on-air pseudonym, “The Humble Janitor.” Since then, Barratt has left his mops and brooms behind and enrolled as a part-time UVM student with a focus in environmental science. He recalls feeling daunted by the task of preparing the demo tape — but in that sentiment he wasn’t alone. From cueing tracks to monitoring sound levels, the technical challenges of running a radio show are many. Then there’s deciding what to play. Crafting a good playlist is an art form: the equivalent of creating a three-to-four-hour-long mixtape every week. To make that process less of a challenge, Barratt follows a general template for each show, typically beginning with metal and harder punk and switching to “poppier” material before he finally “slows the mood down” with ska. Barratt compares making a playlist to beat matching, a technique hip-hop DJs use to synch tunes and ease transitions. Barratt speaks in the rounded, edgeless manner often associated with the hearing impaired. Generally, speech doesn’t seem to be a hurdle for him in person. He is a fluent lip reader. But it does present challenges in a forum such as radio, which demands clean enunciation. Barratt focuses intently when he needs to speak into the mic, taking great care to pronounce each word as clearly as possible. After reading the ride board — or rather, announcing the lack of rides on offer that week — he turns to this reporter and says he thought he did well. And he did. Not many listeners would confuse Barratt with, say, Casey Kasem. But anyone tuning in at that moment would have gotten the message loud and clear. Still, Barratt prefers to let his music do the talking.